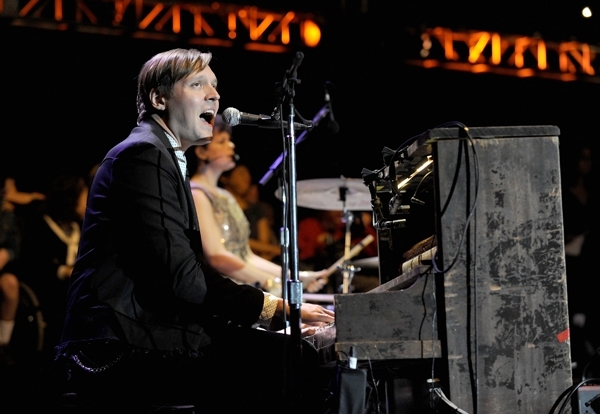 Arcade Fire have set up shop at DFA Records' New York City studio, owned by former LCD Soundsystem mastermind and DFA co-founder, James Murphy. "Arcade Fire STILL with us at DFA," read a post on the DFA Twitter feed. "This is going to be one great sounding album!" The band has been working on the long-awaited follow-up to their 2010 LP, The Suburbs, with drummer Jeremy Gara telling an Ottawa radio station back in October that they hoped to have the album out by the end of 2013. In December, the band's manager, Scott Rodger, revealed in an interview with Music Week (as captured by the fansite Arcade Fire Tube) that the band was also working directly with Murphy, as well as longtime collaborator Markus Dravs. Neither a title nor official release date for the impending album have been announced. Back in January, the band put their converted church recording studio up for sale. Located in Quebec, the band purchased the building in 2005 and recorded both Neon Bible and The Suburbs there, but sought a new place to record after the building's roof began to collapse. Other musicians like Beirut and Owen Pallett have also recorded there.